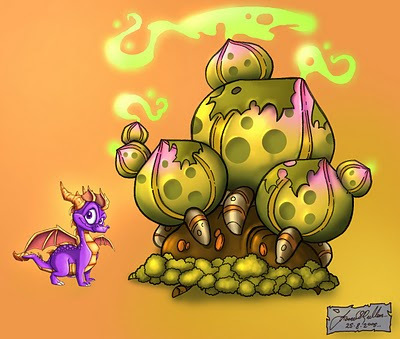 The image of the great Guardian statue above was an homage to Dragon culture in general, but more specificly a stately and regal representation of an actual ancient Dragon hero... the last Purple Dragon before Spyro's time. 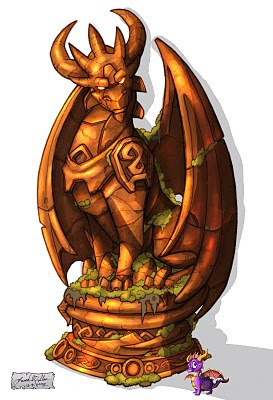 Indeed it was my intention to have this statue foreshadow Spyro's future, and set down a clue as to what he may even look like in the coming decades. From the very outset I wanted to portray what a fully grown adult Purple Dragon would look like, how it might stand and carry itself, and I pitched the idea that the statue itself was actually a representation of The Dark Master.... before he renounced the path of good. So you could say that right from the beginning, from 'the new beginning' we had already caught a glimpse of the Dark Master... I thought it a very fitting and 'full circle' type thing to do. So here's to a fun time well remembered, and to creating alongside talented friends! I hope you enjoy this offering! There's a story with this piece and the other Dragon armour relics... (as there is with so many pieces from TLOS) This helm was intended to be Ignitus' personal war helm... 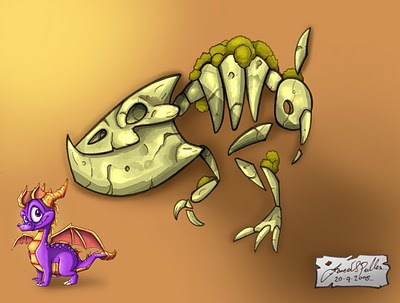 I drew it up as a feature prop and a story hook for Spyro for when he first encounters Ignitus. The story went thusly, that back during the 'Ape Wars' Ignitus was a General who led a company of War Dragons into battle against the forces of the Dark Master. After a fierce struggle in which many Guardians were lost, Ignitus' forces were driven back until only the four Guardians remained. 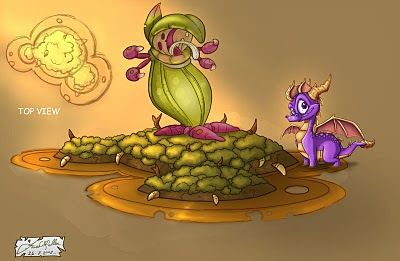 When Ignitus failed to repell Gaul (the Ape King) and gave up custody of the last remaining purple Dragon egg (Spyro) in a biblical flavoured attempt to save him, Ignitus exiled himself to the Swamp, casting off his armour in despair, becoming the crestfallen figure that Spyro meets in 'A New Beginning'. As an idea I'd intended the Helm, the broken Lance and the Shield to be symbols of Ignitus' return to vigour. At Ignitus' request I'd intended Spyro to go on a mini quest to hunt for and retrieve the missing pieces of Ignitus' armoury. This was to be a way of developing a friendship with the old Fire Guardian, introducing a clue into Dragon culture and Ignitus' military past, as well as reinforcing the magnitute of his feelings of failure. 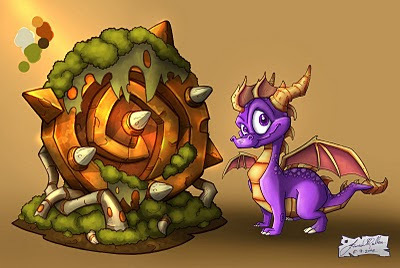 It was a way for Spyro to actively rekindle Ignitus' desire to rise from his despair in the game. 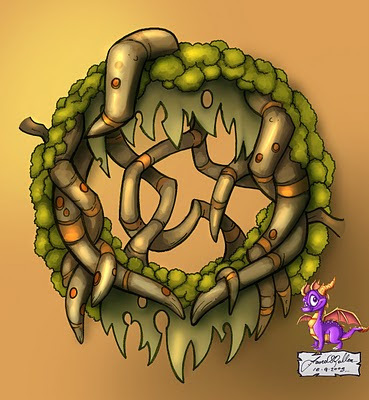 Iconography in the world of Spyro was very important to me, and you may have spotted a great deal of it already... 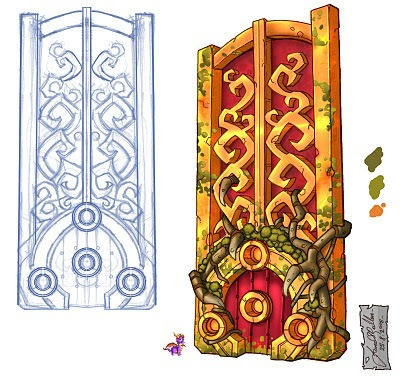 I'll talk more about the graphic language of Spyro in a future post later on when I can explain it in closer detail. 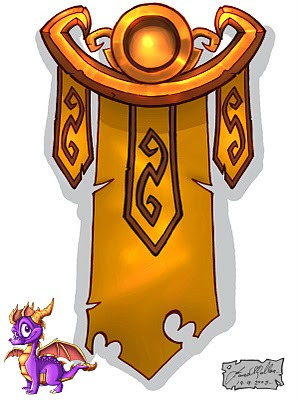 Strangely enough, this image was by far the most prevalent of all images that went out when Spyro TLOS rolled out onto shelves. 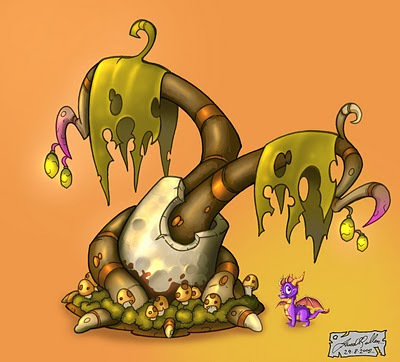 The 'Feature Tree' of the Swamp became the official mascot of the series and seemed to resonate with many people for its stylistic simplicity. Originally created to fill an enormous void in the starting area mesh in the game, this 'tree' added so much charm to the space that it became the style exemplar for the rest of the Swamp world's content... and so the 'Mushroom Swamp' was born. 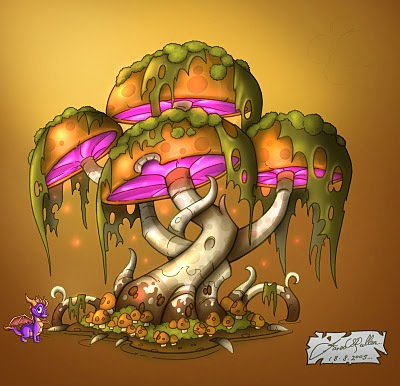 Talented concept artists like Ben Ward, Ron Marc and Mark Douglas pushed things furthur to create the gorgeous mushroom forest walls and twisted vine laden corridors that set the Swamp world apart. 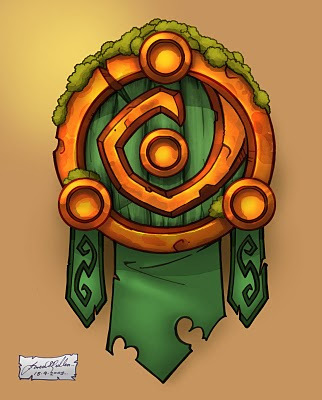 Check it out in game... in 2006 it was something quite unique at the time and something I was proud to be a part of. So keep creating, and more importantly keep creating stories... for the trick to creating memorable art and works that capture the imagination seems to be all in the details; obvious or implied. 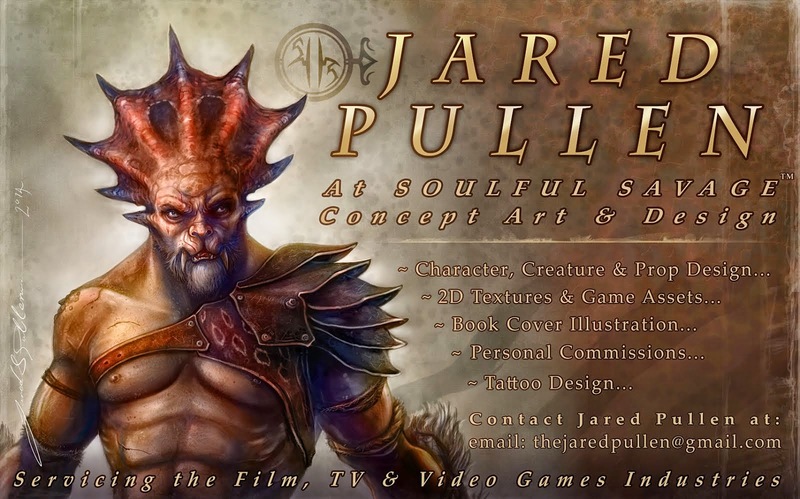 Thank you, Jared, for sharing us Spyro fans more of your work and words from your experience and knowledge of the Legend series! 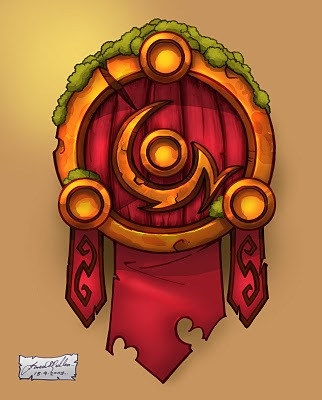 :3 Are you planning to reveal more art to us soon? Have fun and keep on slammin. Wow! 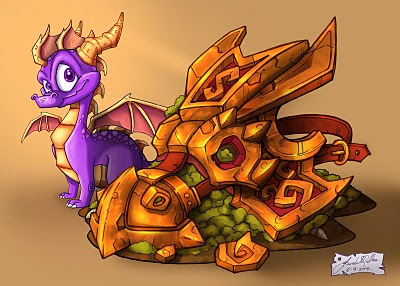 Thank you so much for posting more of your awesome artwork for the Spyro series! I'm a big TLOS fan and I really enjoy seeing the detailed artwork and also reading the stories that go along with it. 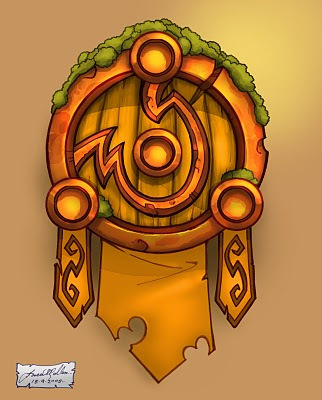 I had been wanting to see those elemental symbols up close for a while! I tried every which way to get a good look at them in the game and just couldn't seem to! The part about Ignitus' armor is especially interesting, i think that would've been great if it had been included in the game. I can't wait to see what else comes out of 'The Dragon's Vault'! Thanks for all the inspiration mate! Some sick design ideas there that give me a few plans with my own art! I can't wait to see more. Most of the Spyro fans on DeviantART are watching you, so keep it up! As a concept artist for ANB, can you tell us if there will be any more games in the legends series? Many of us are disappointed that it has gone on a different path with activision, especially since they got rid of our favorite dragoness too. I haven't been back to your blog in a little bit and this is a very great treat to come back to! Your versatility in this game is very impressive. One of the things I enjoyed the most about the series was the creative environments with all of their details as well as the wonderfully designed characters (good guys and bad alike). Seeing that you played such a big role in making all of those elements is really stunning! wow man! It's so cool to find someone who puts their whole heart into their art! I really love your style dude! I always wondered what the story was with all those cool details. I think those games would have been so much cooler if they would have just let you do your thing. I've always liked Spyro since I was a little kid but it was Tlos that really made a fan out of me. I wish Activision would have put as much soul into it as you did. I think it's way awsome that you put your work up on the net! it really gives the game a whole new wonder to it's background. I really enjoy your pictures, they have exellant color and curve to them and I look forward to your next works. Go for all you want people... I wish you all the very best. Keep on slammin. My friends and I, in light of Activision messing up Spyro, want to create a fangame continuation of Legend of Spyro. Your explanation of Ignitus' armor and that bonding element between him and Spyro...that just gave me a ton of ideas. 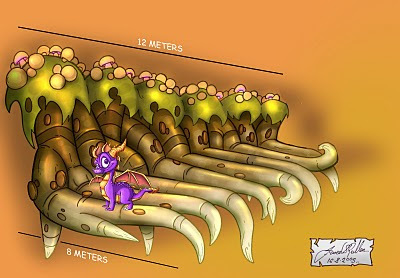 Also if possible...since "Legend of Spyro" has been abandoned, do you think you could give us some insight on where it was intended to go? We understand if that's not allowed, but if you check out my blog for our project (http://los-continued.blogspot.com/), in the disclaimer our goal is to "preserve and continue something that touched our hearts and minds". 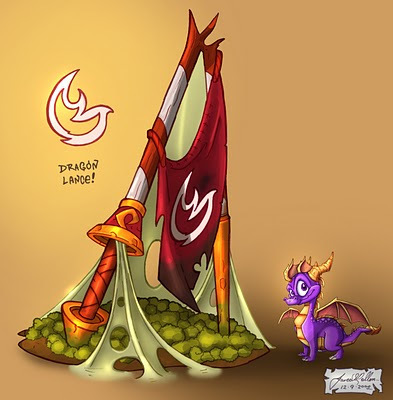 Insight into the game's design would greatly help us keep our favorite Spyro alive. If it's okay with you I'd love to recycle your ideas for story into our continuation, especially Ignitus's armor pieces and their backstory, but I can understand if you'd rather us not. I'd wander round the game just taking in all the detail, I found the helmet in the training room and spend ages trying to get spyro to sit on it so the camera would get a better view of it.